The biggest news of this year’s Star Wars Weekends, of course, was the reopening of the newly upgraded and reimagined Star Tours ride. Despite the high interest in the ride, the Disney staff did a great job managing the crowds, adjusting the queues as necessary and keeping the posted wait times up to date. All six “departure gates” were running throughout the weekend, so even the standby wait time was rarely longer than sixty minutes. That was much appreciated – we got to take the ride nine times each! Also appreciated was the fact that most of the wait, although outside, was in the shade. The enormous display screen that cycles among planetary tourism advertisements, Star Tours company ads, a Spaceport Live Cam, local weather reports for planetary capitals, and the arrivals and departures board. 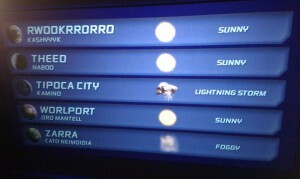 Many planets listed are from the Expanded Universe, including Abregado-Rae, Chandrila, Empress Teta, and Ord Cantrell. Also amusing was seeing Naboo and Nubia with adjacent listings, given all the confusion caused by Qui-Gon Jinn referring to the Queen’s starship as “Nubian” in The Phantom Menace. Threepio and Artoo preparing the starspeeder for flight, and bickering with each other while they work. As always. After the “Visit Naboo” ad airs, Threepio comments, “I find those Gungans rather annoying.” When Artoo beeps a question, Threepio replies, “No, not just Jar Jar. All of them.” Hilarious! The dramatic irony of the “Visit Alderaan” ad mentioning that it has been voted the safest planet in the galaxy by a tourist magazine. Ouch. Easter eggs – including hidden Mickeys – can be found throughout the queue. Tricia’s favorite thing to watch was the blue silhouette portal. You’ll see all sorts of Star Wars character up there, and some that haven’t been imagined yet. The ride itself is an amazing improvement over the much-loved original version. The crisp digital visuals alone are simply stunning compared to the mid-1980s effects in the original. 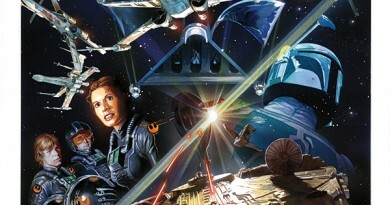 Add in the depth provided by the 3-D glasses, and you really feel immersed in the Star Wars galaxy like never before. Between our 18 combined trips, there were 15 different variations. We each had one identical trip in our respective nine, and we had one other combination in common. Lex saw slightly less variation overall, but that was mostly his misfortune of seeing the Kashyyyk-Coruscant combination in six of his nine rides. It took until his ninth trip to finally get to see all six planets. Tricia had more variation among her rides; she saw the same two-planet pairing only twice. But it did take until her ninth trip to finally get the Leia message. Tricia’s highlight was her first trip on Monday morning, when she was picked out as the Rebel Spy by the Imperial droid attempting to seize the starspeeder! A few tips for future galactic travelers: The best time to ride is first thing in the morning or late afternoon. Make sure you go through at least once as a stand-by rider; it’s the only way to absorb all the goodies inside. The Rebel Spy was picked out of the first or fifth row every time Tricia rode. (Lex wasn’t nearly observant enough.) The front row has great unobstructed visuals, but it’s hard to see the auxiliary screen. The last row is seated higher and affords the best view of everything. There is much more to discuss, so we’ll be trickling out our notes over at the Cantina’s Star Tours thread if you want to hear about more specifics. There are four shows running in the Premiere Theater. Inside the Saga with Anthony Daniels only ran the first two weeks, but James Arnold Taylor’s Stars of the Sagagoes all four weekends and will change from week to week depending on each weekend’s celebrity guests. Be sure to hit Stars of the Saga early because the stormtrooper act is unbelievably funny. If you went last year, you’ll recall Boba Fett did some damage on the troopers; this year, let’s just say – don’t mess with the Wookiee! This weekend the TCW session was hosted by Ashley Eckstein with special guest Dee Bradley Baker. Each session also got a brief cameo from James Arnold Taylor, who wore his Obi-Wan outfit much to Tricia’s FANgirl delight. James explaining how Osi Sobek’s is a combination of Christopher Walken and Al Pacino. You’ll never hear the Citadel warden the same way again. James having his adorable daughter Lydia model Ashley’s “Daddy’s Little Girl” shirt from the Her Universe line – then ripping open his own button-down shirt to reveal he’s wearing one, too! Between Dee and James, they represented just about every animated show on television. Dee is a master of sounds and James voices an incredibly broad range of characters. Everyone on the panel was enthusiastic about their work on TCW, and everyone spoke very highly of Dave Filoni. It’s in part this great team attitude that has gone a long way to sell the show to the masses. Ashley revealing that they’re almost done recording Season Four. Wow! Dee mentioning that he voices Klaus from American Dad, then adding (in that thick German accent) that “it’s not appropriate” for the kids. Too funny! Dee explaining how he and Dave Filoni came up with a “triangle” based on a clone’s status, experience, and age to develop the variations in each clone’s voice. Very insightful and very cool. The goofy voiceovers to a clip from the first Citadel episode, such as Dee voicing the clones as Daffy Duck or James voicing Ahsoka as Shaggy. Ashley making sure the young ladies in the audience got to ask a question of Dee. All the girls modeling their Her Universe gear were down in the front, so as he wandered the audience for questions the young female fans almost were forgotten. This one-man show was simply amazing. James got a well-deserved standing ovation at both of the shows we attended. Even aside from his vocal gymnastics, though, the show was impressive for the moments he took to emphasize his own focus on pursuing his dreams and reminding the audience how important it is to dream – and to reach for yours. Great advice, James! Reading an electronics instruction manual in a Gandalf/Plo Koon voice, just to prove that a voice like that really can make anything sound interesting! James revealing several of his absolutely uncanny voice-doubles, including Michael J. Fox and Ewan McGregor’s Kenobi, perfected doing voiceover work for videogames. Hearing James double the “you were my brother, Anakin!” speech from Revenge of the Sith leaves no doubt why they hired him for TCW. Most impressive! And the massive run-through of celebrity voices to end the show – simply astounding! 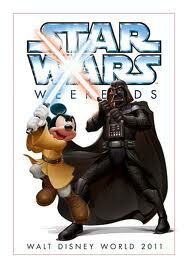 If you have a chance to attend Star Wars Weekends, be sure not to miss this! Tip: The theater never quite filled up for the shows, but once the show starts no one else is let in. So be sure to get there on time, but you probably don’t have to worry about needing to line up like this is a Celebration panel on the Clone Wars. The unofficial end to the day at the park is the Hyperspace Hoopla at the Hat Stage, once again this year featuring the Dance-Off with the Star Wars Stars. You haven’t seen a Star Wars dance-off until you’ve seen Chewbacca in a red bandana rockin’ out to Guns ‘N Roses. The hostess making a Robot Chicken Star Wars reference in dismissing the Imperial side from the stage (“You smell like feet wrapped in bacon!”). Oh, no! It's a trap! If you haven’t made plans to visit a Star Wars Weekend at Disney’s Hollywood Studio, we highly recommend it. Each year this event gets better and richer for the Star Wars fans. Lex and I both commented that we hope that someday Disney and Lucasfilm will be able to bring back the special version of the Indiana Jones Stunt Spectacular from Celebration V – the Star Wars/Indy crossover “Raiders of the Lost Jedi Temple of Doom” – for Star Wars Weekends. It was such a fun show last August, and it would be another great step toward completely engrossing fans. (But certainly no complaints about what we’re already getting!) From start to finish, our visits to the park were immersed in this wonderful pop-culture lore. We can’t think of a better way to spend a summer weekend as a Star Wars fan! Can’t make it this year? In recent years Star Wars Weekends have been held the last two weekends in May and the first two weekends in June, so mark that down on your 2012 calendar! Tip: Staying at one of the Disney resorts may provide additional fan excitement. Tricia spotted Dee Bradley Baker sitting at the table next to her at one of the resort’s fine dining establishments. Finally, Tricia wore the “it’s chic 2BA geek” shirt to the park on Monday, and received positive feedback from multiple fans. Check out the FANgirl Boutique for more information. 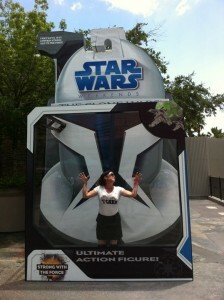 For more pictures from Star Wars Weekends, check out Fangirl Zone on Facebook. Win Tickets to Celebration From RebelForce Radio! Oh how FUN!!! My first trip to Disney Studios (back when it was MGM) was for Star Wars weekend and I had a BLAST! I think it was the first time they opened the Star Wars ride, though I’m not too sure. It was a lot of fun and yes, going as a standby rider is a must because there are so many things to see inside! I think the real highlight of my trip was taking pictures with Chewi! He was awesome! !